For many, many years the noble hamburger came with a certain stigma attached to it (as many other things, see previous blogs). It was thought of as a cheap and sometimes nasty source of sustenance. Jokes about how toes nails, eye lids or even worse may have found its way in to the grinder and then into the hands of that angst filled teen manning the grill who is still trying to accept Kurt is gone and his mother does actually love him. Then to be slapped on that grill, hammered with heat until all moisture or any hint of juiciness that could possibly be there is well and truly evaporated into the ether. I spent most of my early life in Canada. And in regards to fast food outlets, we were spoiled for choice! Not just the old mickeys or the king, I am talking Wendy’s, Pickle Barrel, Arveys and Harvey’s and countless ones I can’t remember the name of. We even ate regularly at a chain restaurant called Red Lobster, where as a kid you got to pick out the poor beast that was going on your plate from a large fish tank as you walked in. You even got to take the claws home in a little party bag! To this day I have never had a lobster that tasted as good as those ones, not even close. By 12 I was a connoisseur of rubbish burgers, crunchy peanut butters, pancake textures and an expert lobster cracker! All was right in the world. At 13 we moved back to the UK, long story but I was grumpy about that. Anyway, to cheer me up my dad took me with him on a business trip to Paris. He was working with MTV at the time and we had tickets to the first MTV European Music Awards. We had a couple of days around Paris beforehand, so we took in the whole culture thing and ate some things I had never even heard of at that point. I watched my dad down snails, mussels, oysters and steak tartar – the whole stereotypical lot. I played it safe – at that point I was more of a ‘cheese nachos and hot dog’ kind of kid. One day I felt like being a dare devil and I ordered a burger. ‘Beain cui, beain cui’ my dad kept saying to the waiter. I just assumed this meant cheers?! When my burger came out I thought it looked pretty good so I chumped down on it while simultaneously reaching for my drink so I could wash down the dry, sand like texture of the beef which I was accustomed to. But wait! This wasn’t like that! It was juicy and moist, it tasted amazing! But as I pulled my freckled covered face away from this new experience, I stared death in the face for the first time. The burger was pink! I never thought I would die in Paris at 13! I had so much I wanted to achieve in life! My sorrow turned to rage as I could not figure out why this classy looking place in Paris would knowingly serve a plate of death to a blue-eyed 13 year old boy with his hopes and dreams ahead of him. Were they monsters? When my dad eventually calmed me down and reassured me I would not be meeting my maker due to pink meat, I went back to enjoying it! Why doesn’t everyone cook burgers like this? In case you haven’t noticed, burgers have made a huge come back in the last few years. The artisan-style street vendors started the trend up again and now many of them have permanent outlets all over London and are spreading out to the rest of the country. Burgers are big business, but the quality has changed. They are using high-quality dry-aged beef, handmade buns and local cheeses. This is a trend we have adapted to our side of the business. 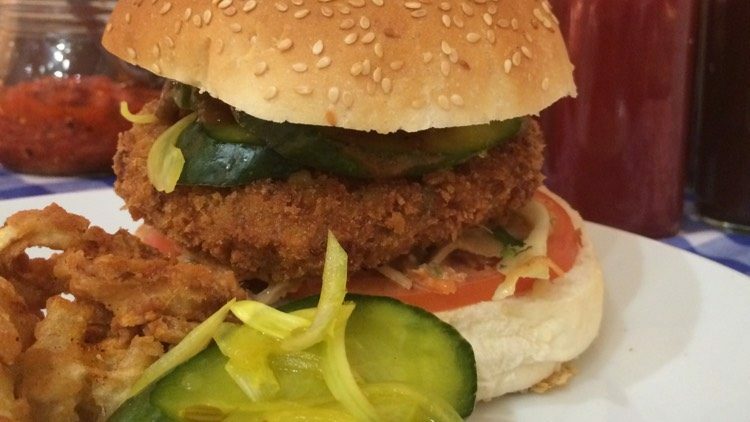 Developing our own signature ketchup, vegetarian burger, bun and even a specific meat grind from our butchers. Gone are the days of dry beef patties from only goodness knows where, flavourless cheese and crouton-style buns. I am proud to say that we put a lot of effort into getting this common fast food right and it is just as good as any big name or small street vendor anywhere. There is a time and a place for the old-style burger from large multinational types, but not on my watch and not in our business. It has to be the best that we can do. From fillet steak to homemade bread to delicate pastries or the noble beef burger, quality is quality, no matter what form it comes in.